Today I attended a workshop session about free online software packages that can be used to enhance learning in the classroom. Lino It and Answer Garden were two collaborative software packages that were presented. They are both suitable for the SFL classroom as the software can be used to encourage learners to share their opinions and knowledge in a non-judgemental and anonymous way. 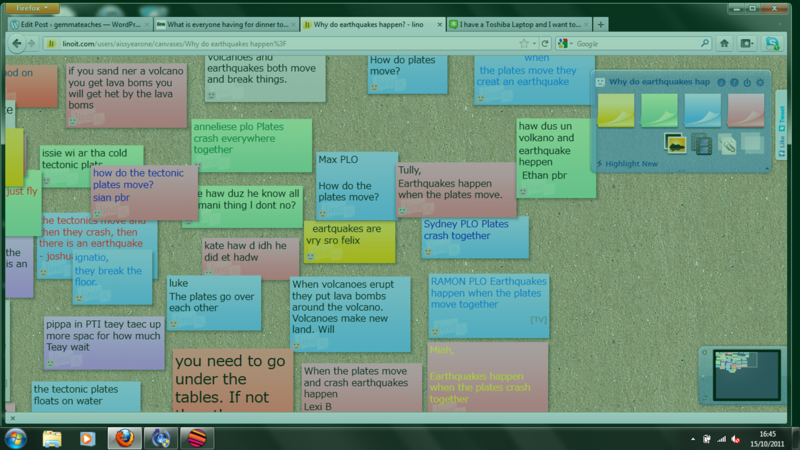 Lino It is a sticky note based web page that can be used to post memos, ideas, and photos anywhere on an online web canvas. You could use the software as a student focused starter or plenary. One of the ways you could do this would be to post a question in the corner of the canvas and then hand the activity over to the students to post replies, for example you could ask the students in what situations have you wrote an email. The students might then reply, to complain about extra charges on a phone bill, to tell a friend some good news or to inform my tutor that I won’t be in for a few days due to sickness. As you can change the colour of the post-it notes it’s easy to add an element of competition to the activity as you could assign a different colour per team, this means that you could also have girls (yellow post-it notes) vs boys (green post it-notes) competition. The team that comes up with the most replies could win a prize such as choosing the next question or activity. The software is also useful as an assessment tool. It could be used at the start of a session to assess the learning and knowledge retention of previous lessons, it could be used at the end of the lesson to check understanding and if you asked the students questions such as did you enjoy this lesson, what did you think about the lesson materials it could also be used as an evaluation tool to assess how well the lesson has gone. Although you can use the software without setting up an account I don’t recommend using the software with your learners without one. By setting up an account you can retain control of the activity once it has been passed onto your learners as you can remove any post that you do not approve of. It is also a good idea to set up different groups for different classes as that way you can keep the canvases private and prevent different classes from cheating by copying the other groups notes. 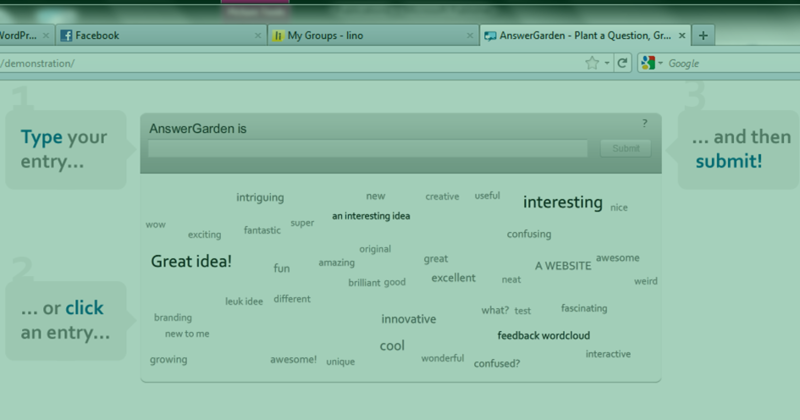 Answer Garden is similar to Lino though it is a lot simpler to use. Once you open up the software click on create, post a question, give your students the url address and once they open the web page they are able to post replies. One of the ways that this could be used in the SFL classroom would be to teach about tallies. The students could post a question e.g what is your favourite mobile phone brand? Share the web page with their class mates and then once all of the responses are in, use the information for creating tallies of how many times each brand appears. Great analysis of the software. These were the two tools today that hit home to me, and that I want to and feel I can easily use in my lesson as lesson starters or lesson finishers. I love the ideas of the lino to capture what learners thought at the end of the session. I was going to post these on my wall, but you have bet me to it. What I might do is have a go at them in my lessons and then reflective on how I used them and how I will use them again. Cheers Gemma, nice meeting you again today. You should definitely post about it too. I’d never heard of either of them until today so I reckon we should spread the word. Think I’m going to try Answer Garden first as Lino might be a bit too complicated for my current batch of learners. I hope they take to it.